Austrian general; born 1822 at Pardubitz, Bohemia; the son of a Jewish tenant-farmer. 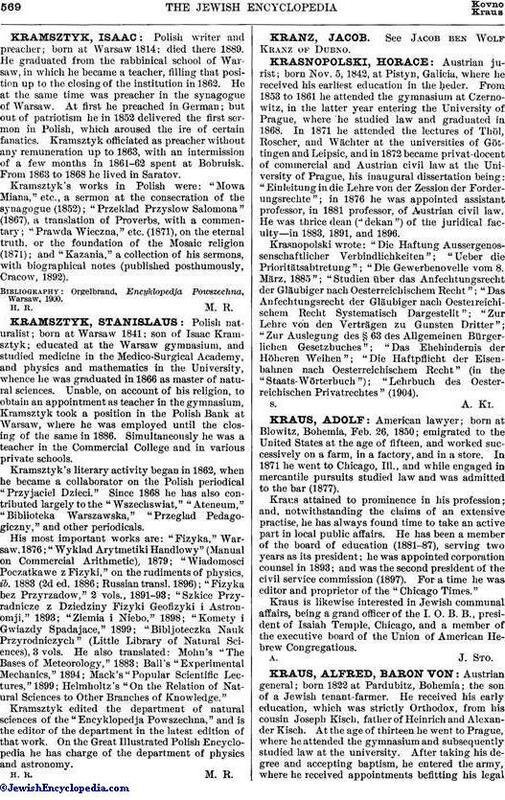 He received his early education, which was strictly Orthodox, from his cousin Joseph Kisch, father of Heinrich and Alexander Kisch. At the age of thirteen he went to Prague, where he attended the gymnasium and subsequently studied law at the university. After taking his degree and accepting baptism, he entered the army, where he received appointments befitting his legalattainments. At Mantua in 1849 he conducted the trial of Orsini, who had been arrested there; and at Parma he conducted the trial of the murderer of its duke. He then entered the adjutant corps as captain, and was appointed, with the rank of major, aide-de-camp to General Degenfeld, the minister of war. For a number of years he was connected with the imperial military court, acting as deputy president from 1869 to 1880. 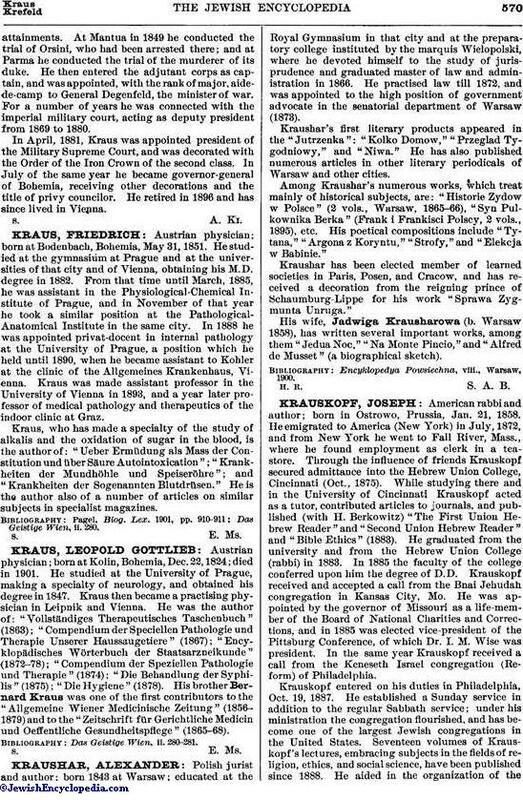 In April, 1881, Kraus was appointed president of the Military Supreme Court, and was decorated with the Order of the Iron Crown of the second class. In July of the same year he became governor-general of Bohemia, receiving other decorations and the title of privy councilor. He retired in 1896 and has since lived in Vienna.